You will not want to miss this fall’s Logapalooza in the four-season resort town of McHenry, Md. Nestled in the hills bordering the Deep Creek Lake resort area, this is a splendid setting for some spectacular Katahdin Cedar Log Homes. In just a few days, join folks coming from Maine Florida and all points in between to join us for this amazing Deep Creek resort event! Katahdin’s day-long log home seminar, to be held on the beautiful campus of Garrett College, is unmatched for information and details to answer all your questions. But here’s what makes this Logapalooza so special: a one-of-a-kind opportunity to TOUR SIX LOG HOMES in the Deep Creek area. We’ll be hosting our day-long program starting with our comprehensive seminar to learn more about building the Katahdin Log Home of your dreams. 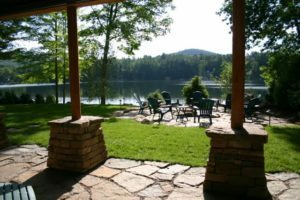 During the seminar we’ll transport you to two Katahdin homes, and after the seminar an additional four nearby log homes will be open for self-guided tours. You’ll experience first-hand the look and feel of a finished log home. More nearby homes—seven in all—will be noted for drive-by viewing. The possibilities are endless when it comes to your own design, and you’ll see some outstanding examples of Katahdin’s well-designed, energy efficient cedar log homes all within a few miles of the seminar event. Make it a weekend of log home fun! We’ve set aside a limited number of rooms at the Wisp Resort for confirmed attendees on a first-come-first-serve basis — there are still rooms available! You’ll have the opportunity to make a weekend out of Logapalooza and still make it home in time to hand out treats to the little goblins and ghosts! Another great way to get the details about log homes are log home shows, where you can see how Katahdin makes their energy-efficient, whole-log-wall homes so beautiful. At each event, we’ll have plenty of dealers from the area and knowledgeable staff on hand to answer all your questions! Bring your ideas, your plans and your questions! We’ll see you there!